In this episode of Find Your Fit, Kevan and Jessica give us exciting updates on their Plank Challenge journeys. Kevan gives the injury update we have all been waiting for, he is finally injury free, feeling good, and ready to run again! Speaking of running, Jessica, Kevan, and Amber are gearing up for the St. Patrick’s Day Lucky Laces 5 & 10K Race. This is the first of three races in the National Fitness Challenge in Colorado presented by WE Fit Wellness, United States Association of Blind Athletes (USABA) and the Anthem Foundation. Go team! Kevan mentions Michal Kapral from episode #27 of the Find Your Fit podcast. Michal raises money for charities when he joggles in races. Joggling, as in running and juggling at the same time! Apparently, joggling is a popular skill in the running community. Most athletes who joggle, including Michal, are very giving of themselves, their talents, their resources, and their time. The team welcomes Sabrina Simmons to the podcast. Jessica met Sabrina at an NFB seminar and was motivated and encouraged by her health and wellness journey and invited her to share her story. Sabrina lost her sight due to diabetes. She gained about 70 lbs. after she became blind and decided she needed to make some changes to lose the weight. Sabrina shares with us about the many styles of group exercises she takes regularly and how she succeeds in these classes as a blind person. She also found fun and unique ways to exercise during normal daily activities and she shares these tips and tricks with us. Sabrina didn’t stop there; she has also made significant changes in her diet. She tells us how a plant-based diet, which has increased her energy level, while helping her to reach her health and wellness goals. One of the books that inspired her to change some of her habits was Dr. Neal Barnard’s Program for Reversing Diabetes: The Scientifically Proven System for Reversing Diabetes without Drugs. For Fit Chat, Jessica, Kevan, Amber, & the Genius tastes protein bars made with cricket flour. 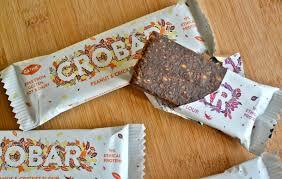 We have two different flavors of Crobar protein bars by Gathr. Jessica is allergic to shellfish, which are arthropods just like crickets, so check out the episode to see if her head blows up like a balloon and how the WE team reacts to this tasty treat! Also, below is a recipe from Sabrina for a Quinoa Lasagna. Give it a try and tell us how you like it. Coat a 9 x 13 pan with non stick cooking spray. Combine quinoa and water in a sauce pan and bring to a boil. Turn down to simmer, cover and cook for 15 minutes or until quinoa is tender. Fluff with a fork and place quinoa in the bottom of prepared 9 x 13 pan or dish. In a sauce pan over medium heat cook onion, garlic, mushrooms until tender. Add garlic and sauce and mix until well blended. Cottage cheese, egg, parmesan cheese, oregano and basil. Spread 1/3 of the sauce over the quinoa. Then layer with all of the zucchini. Add a layer of all the cottage cheese mixture. Add half of the remaining sauce. Finish with remaining sauce and sprinkle mozzarella cheese over the top. Note: if there is not enough sauce, omit the second layer and use it on the top layer. Bake until hot and cheese is bubbling and slightly brown around the edges. This should take 35-40 minutes. We would like to thank our generous sponsors: Push Beverages, the Colorado Center for the Blind (CCB), and the National Federation of the Blind (NFB).